Passiontide: The statues are all veiled as we approach Holy Week. Let us pray that we can have one last effort at our Lenten resolutions before the joy of Easter. We prepare now to contemplate the Holy Cross and all that that means in our daily lives. St John Vianney, the Parish Priest of Ars said, “all of our troubles come from not loving the Cross!” There is no crown without the Cross, there is no victory without the battle; there is no dawn without the night. We ask Our Blessed Lady of Sorrows to obtain for us the grace and courage to pick up our Cross and to win its’ promised grace! Palm Sunday (20th) 9am Procession from St Bede's School. 11am Latin Mass with Procession. 11.30am Mass of Chrism at St George’s Cathedral. 7pm Tenebrae. As in previous years the Cantores Missae choir will be singing Victoria's poignant and powerful settings of the Responsories for the Office of Tenebrae. Maundy Thursday (24th): 6pm (Latin); 8pm (English); Adoration 9.30pm – 6am. Easter Sunday (27th): 8am; 9.30am; 11am (Latin); No evening English Mass6pm Misa en Espanol. Lenten Extra Daily Mass: Now that we are in Passiontide, let us intensify our efforts and try to go to Mass at least once in the week. Laetare Sunday Photos: Fr Pawel has uploaded the photos taken during the 11am Mass last Sunday onto our blog. Why not go online and have a look HERE. Girl Readers & Boy Servers Groups: have both had a bevies of suitable volunteers. We have had several meetings at school and one for each in Church. After Easter we hope to have some more so that we can bring on the new life! Confirmation Application Forms: Please collect your application form from Fr Christ this weekend. Candidates must be Year 8 or above. Attendance at the Easter ceremonies is part of the programme which will be given out next week. 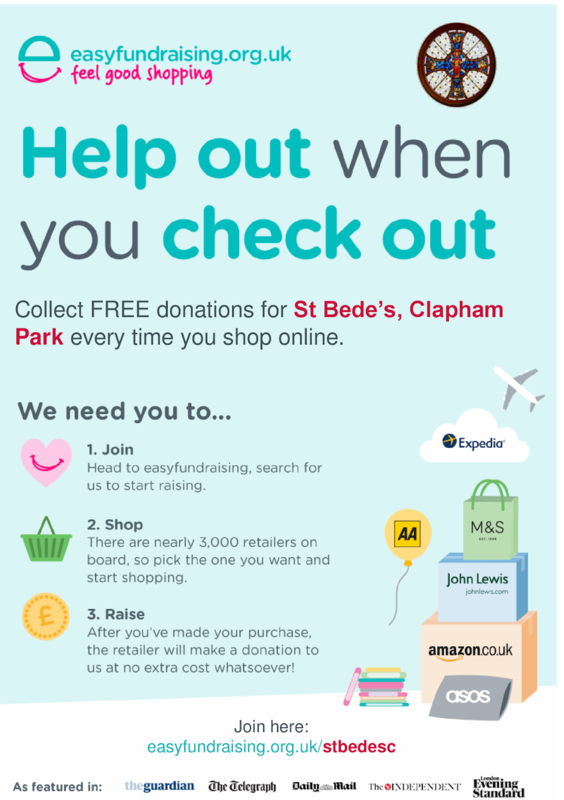 Easyfundraising: Don’t forget to use our Easyfundraising page when you are shopping online. 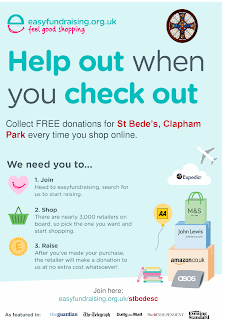 Your support of our parish through this and the Gift Aid scheme is greatly appreciated. World Youth Day - 25th July to 1st August: : There are still a couple of places left – see Fr Pawel for the application form. For those of you who have already stated your interest - please hand in your booking form ASAP! Please Note: You must be over 18 years old (at time of booking) to be able to attend this event. Family Retreat: 1-3 April at Ratcliffe College nr Leicester with 2 priests from Papa Stronsay. Also at the same time/venue there will be the Chant Course with Colin Mawby & Chris Hodkinson. Contact John Tennant or see www.stcatherinestrust.org. Minibus places available. Summer School: 24-31 July - with our very own Fr Andrew Southwell. For 11-18 year olds. Sung or High Mass, Rosary & Compline each day. Partasaph Friary, N. Wales. Minibus places available. Contact John Tennant or see www.stcatherinestrust.org. School Governors: Words cannot express our gratitude to John Reddin, Dominic Lynch and Kate Peacock who have all served on our School Governing Bodies. They have totalled up a huge half century in years of generosity. Now we need successors. What about you? Active Kid Vouchers: It is that time of year again when Sainsburys run their ‘Active Kids Voucher Scheme’. Both of our schools are collecting these vouchers so you would like to donate yours, please drop them off at the school or in the envelope at the back of the Church.